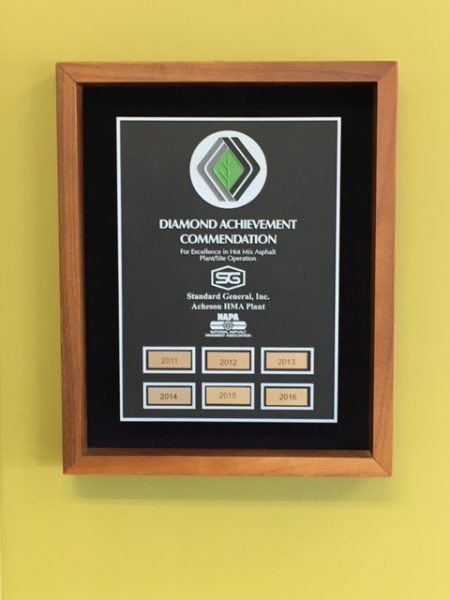 Standard General Edmonton is proud to have been the recipient of various awards which recognize the first class work our company performs, our commitment to being responsible corporate citizens and our goal of making safety a top priority within our company. Below are some of the awards that Standard General is pleased to highlight. Standard General Inc. was honoured to receive this award for the work done on what was known as “The Rat Hole” downtown in the City of Edmonton. The 109th Street underpass was demolished and a new intersection built to replace it.The project was finished in six weeks rather than the original projected four months. Safety is a top priority in our company. 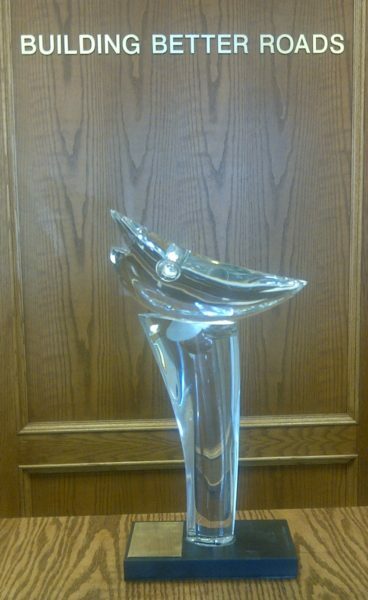 In 2001, Standard General Edmonton was part of the group that was awarded the International Crystal Woodpecker Award from Colas. 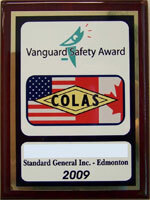 The Woodpecker Award is the highest safety award achievable by all Colas companies worldwide. In 2001, we achieved a safety rating of 0.00, an accomplishment that Standard General Edmonton, as a subsidiary of the ColasCanada group of companies, was very proud to contribute towards. 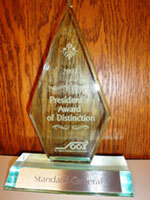 Standard General was pleased to be awarded the City of St.Albert’s President’s Award of Distinction in 2003 for its contribution to the spirit and success of the City of St.Albert. Standard General was selected by St. Albert’s Chamber of Commerce President to receive this prestigious award as recognition of the positive impact that Standard General has brought to the city. 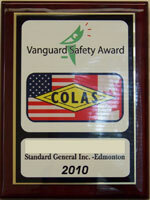 In 2008, Standard General was again honoured to be awarded the International Crystal Woodpecker Award from Colas. 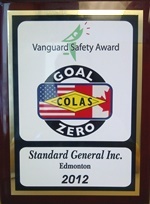 In 2009, 2010,2011 and 2012 Colas North America honoured Standard General for its exceptional safety performance. From the National Asphalt Pavement Association (NAPA), the Diamond Achievement Commendation for our Acheson Asphalt Plant. 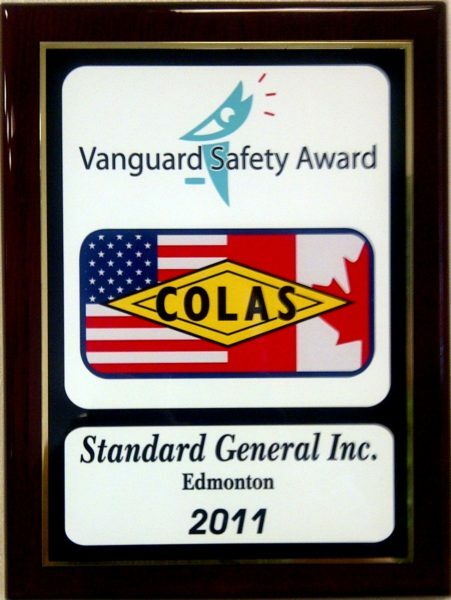 In 2011, Standard General was awarded the Colas Woodpecker Award for Safety. This prestigious award recognized Standard General for the best safety award for all Colas companies worldwide and is the highest award achievable within the group. With over 500,000 man hours worked in 2011 and no lost time accidents, we are very proud of this achievement which highlights our commitment to safety. 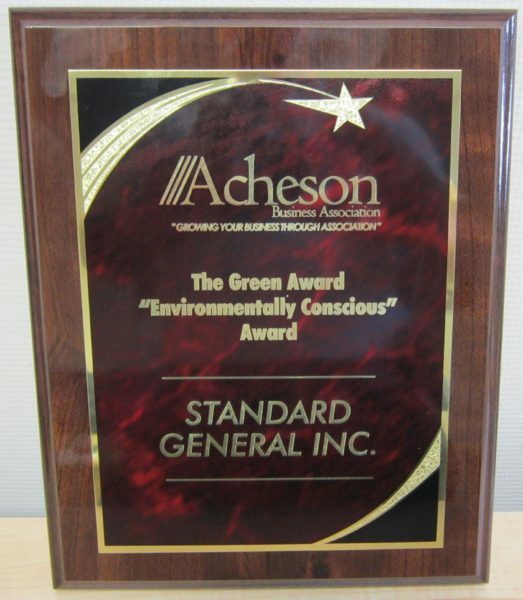 Standard General was the recipient of the Green Award from the Acheson Business Association, acknowledging our efforts in greenhouse gas reduction, energy efficiency and pollution control for our rail unload and asphalt plant facilities in Acheson. The Acheson Business Association recognized us for our site cleanliness and our gravel delivery by rail to our site which emits far less CO2 than by delivering via truck. Standard General was the recipient of the Construction Marketing Association (CMA) Star Award for the Internet – Social Profile Design category recognizing our efforts in internet, website design and social media presence. The CMA Star Awards showcase the very best in marketing, effectiveness and creative execution.